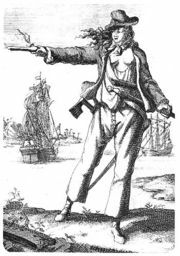 Anne Bonny and Mary Read were feminists long before that word came into common usage. They established themselves as successful pirates, breaking through the biggest glass ceiling of their day. In fact, history has romanticized them so much that in recounting their lives, it’s difficult to separate fact from speculation. Anne Bonny was allegedly born sometime around 1700 in Ireland, the love child of attorney William Cormac and the maid. When Mrs. Cormac found out about the affair, she exposed her husband’s infidelity and ruined his reputation. This forced Cormac and the maid out of town, and they moved way out of town to the United States, settling in Charleston, South Carolina. He reestablished himself as a lawyer, made a fortune, and bought a plantation. Stories differ about Bonny’s teenage years. One account says she stabbed a servant girl in the stomach with a table knife. Some claim that the source of her temper was the death of her mother. All agree that about age 16 she married James Bonny, a poor sailor, wanna-be pirate and opportunist. This charming fellow was not her father’s choice for a son-in-law, so he disinherited his daughter. Whether Bonny set the plantation on fire in revenge or not is disputed. We do know that at some point the Bonnys moved to Nassau in the Bahamas, a popular base for pirate operations. Bonny became restless while her husband was away perfecting his pillaging and plundering and beefing up his resume as a buccaneer. She met John “Calico Jack” Rackham in one of the local bars, and they had an affair. James Bonny discovered his wife’s indiscretion and dragged her in front of the governor for punishment. Governor Rogers sentenced Bonny to flogging, but Rackham did the chivalrous thing and came to her rescue. Together they stole away on his ship, Revenge, and as a crewmember, Bonny began her career as a pirate. Mary Read was born about 1690 in England to an impoverished widow of a sea captain. When Read’s older brother died, her mom dressed her like a boy to trick her mother-in-law (who did not like girls) into providing financial support. Grandma was duped and gave them money until she died. Cross-dressing proved so successful for Read that she used it to get work as a footman, and then become a soldier. She fell in love with a fellow soldier, disclosed her true gender, and they got married. Together they ran The Three Horseshoes inn in the Netherlands. Read adapted herself to the role of the wife of an innkeeper and dressed like a woman until her husband’s sudden death. On her own, Read relied on previous experience and used her husband’s clothes to disguise herself again as a man. She eventually ended up on a merchant ship bound for the Caribbean. That ship was captured by pirates and Read was forced to join them. This ended up being a dead end job, so the crew accepted the King’s Pardon around 1718, and continued operations as privateers. At their sentencing, Bonny and Read “pleaded their bellies.” By declaring themselves pregnant they received a stay of execution until after the birth of their babies. It is most widely believed that Read died in prison either of illness or in childbirth. There is no record of Bonny’s execution or her release. However, most speculation supports the story that she was ransomed by her father, gave birth to Rackham’s son and was buried in Charleston, South Carolina. One source gives her the benefit of a true Hollywood ending by marrying a fellow Carolinian and having eight more children. QUESTION: What career would you love to try? Dancing wearing glitzy costumes like in Las Vegas will work for one of my career fantasies!